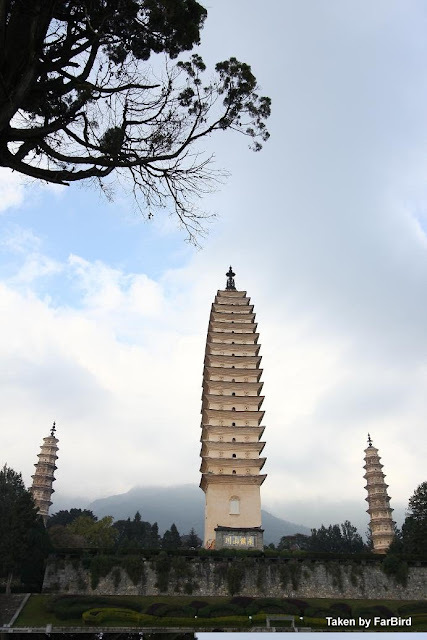 On the morning of our 4th day in China, we were on our last day in Dali and we visited the famous Chongsheng Temple with the historic 3 Pagodas. In the olden China, Dali was a kingdom (Dali Kingdom) aka the "Nanzhao Dynasty", ruled by for 22 generations by the "Duan's". Buddhism was the state religion and 10 out of its 22 kings had given up their throne during their time to become buddhist monks. And the 3 pagodas were the place where these kings gave up their imperial lifestyle and ordained as monks. Much of the temple were destroyed by wars and natural disasters and only the 3 pagodas were the original buildings that was relatively intact throughout the years. After visiting Chongsheng Temple, we left Dali and headed to Lijiang. 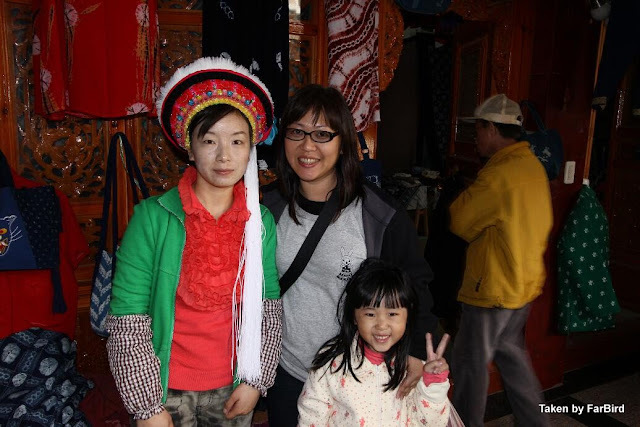 The first stop at Lijiang was the old town center, where it is now listed as a Unesco World Heritage site. This town center was the distribution site for merchants whom travelled the Ancient Tea Route or literally translated from Mandarin, the "Tea Horse Old Route" (茶马古道). According to history, China merchants travelled far and wide to trade tea with neighbouring countries and Lijiang was one of the prominent stopover place along their trade route. This famous "Tea Horse Old Route" was supposedly to have equal historical importance to the "Silk Road". The native minority there is known as the Nakhi tribe (納西族). The Nakhi tribe have their origins from the foothils of the Himalayas. They are very musically inclined and we saw our local Nakhi tour guide singing most of the time while describing sights along the way! Again, we are taught how to address the local men and women. 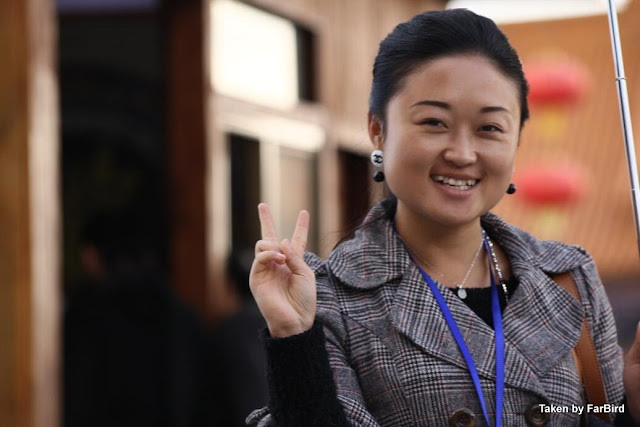 We have to address the local ladies as "Fat Golden Sister" (胖金妹 ) and the local men as "Fat Black Brother" (胖金哥). As to why the locals address each other as fat and dark is because in Lijiang, it is not easy to find a rotound local because of the tough environment and climate. And in Lijiang, big is beautiful. No wonder I get all kinds of sheepish stares from the local ladies... hehe..
Back to the Nakhi tribe, during the days of the tea trading times, most of the goods were carried by horses by the merchants and the Nakhi tribe, being in the center of this ancient route, were the couriers and forwarders of the merchants. 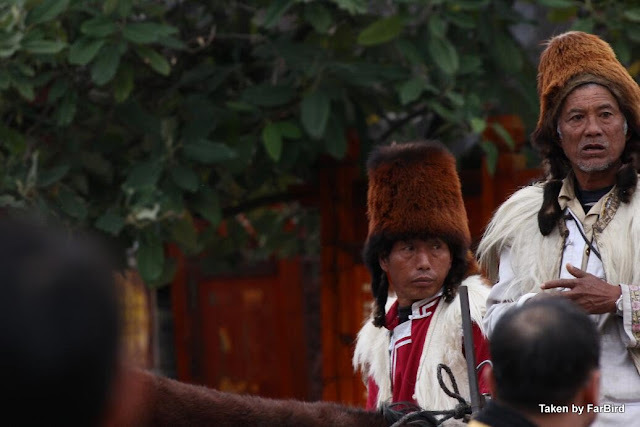 Since they are well known for their toughness and stamina, there were the horsemen for the merchants and they form their own horse gangs (马帮) to ensure that they are kept safe from mountain bandits by travelling together. Did I mention that Yak is as popular as Beef in Lijiang? From See the rest of the pictures from Day 4 in China here!